Casa Gaia is part of a complex that includes 2 other villas. Located in the heart of Tuscany, the Cottage is immersed in the Chianti hills and surrounded by vineyards such as the famous Marchesi Frescobaldi, and a large, private garden. The Cottage has been completely restored. The comfortable furnishings are in typical Tuscan country-style. 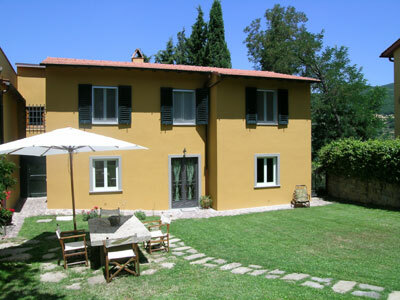 Just 25 km from the historic center of Florence, the Cottage offers an ideal setting for a relaxing vacation in Tuscany. The Cottage is located in the heart of Tuscany, just 25 km from the historic centre of Florence, surrounded by vineyards, olive groves, fruit trees and woods. A slightly inclining gravel road leads to the property. It is advised that guests have a car at their disposal. Mid Season: Easter week; 26/Apr-21/June; 23/Aug-13/Sept; Christmas and New Year's season. Low Season: All other days.